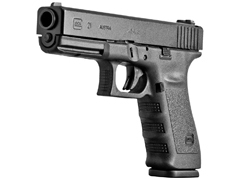 Pistols are a mainstay of shooters because they are the most common type of firearm and most familiar to the audience. Since Wolfentein 3D it has been put in the hands of new players to give them a taste of gunplay, while still giving them plenty of room to grow into more formidable weaponry. 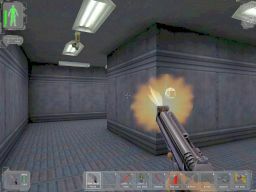 Quake 2 started the short-lived trend of giving the pistol unlimited ammo so that the player does not have to fall back to melee attacks, but that was quickly eclipsed by the idea of the pistol being a low-powered precision weapon. Counterstrike in 1999 cemented the concept that a highly skilled player could be incredibly deadly if they could manage the head shots required to get a pistol kill. 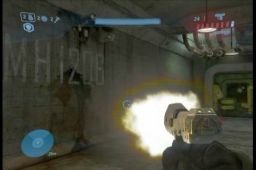 The Halo pistol is a fun one to start with because it is everything Halo’s Assault Rifle isn’t. The visual effects has a nice white-hot flame and a bit of smoke that covers a good chunk of the screen but disappears quickly. The audio is punchy but has a little throaty-ness to it. The effect on the environment is slight, with only a small spark on the walls however. When firing at an opponent, there isn’t a whole lot of feedback because there is little impact and they don’t always seem to hit react, unless you hit them in the head. 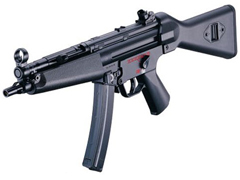 In gameplay it has a steady rate of fire and reasonable stopping power that makes it fine for a skilled player. 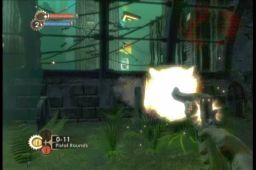 Resistance’s arsenal had a lot of special-function weapons (being from the Ratchet and Clank folk), so they skipped the pistol in this game. Being a fan of every weapon having a “raison d’etre“, I certainly don’t mind that they didn’t just throw in a pistol for extra quantity. The Half-Life pistol is fairly unique in its semi-auto capability, which allows it to shoot as fast as you can hammer the trigger… making it extra-deadly in the hands of the skilled. 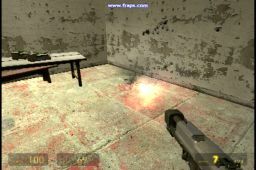 The weapons in Half-Life tend to go a bit light on the pyrotechnics of the muzzle flash (which is more subtle and realistic), but the sharp crack and echo of the pistol audio makes it pretty dangerous-sounding. The environment impact effects are fairly small and smoky, but the bullet holes and tiny bouncing chunks coming off the wall add a nice sense of the physicality of the environment. When striking an opponent, the bloody impact is small unless there is a wall behind to show the blowthrough, but the nice part is the fact that humanoid enemies do twitch their body parts a bit upon impact, even if they are returning fire at the moment. Considering it comes from my Alma Mater, I expected some meaty weapons from Quake 4 on par with the macho ones found in the Soldier of Fortune series… However, the pistol’s definitely a bit player in the game, doubtless because of the fact that it does not consume ammo. Its conical muzzle flash is subtle, and the bullet trail doesn’t add much to the gravity of your projectile. The “spacey” firing sound with an incredibly short envelope makes it seem more like air pistol, but again it’s probably on purpose to give more value to the weapons that aren’t “free”. The impact effects are nearly invisible, but at least the weapon has a nice light source when fired in a dark area. The impact on enemies is very slight as well, with only the occasional hit reaction until the enemy goes down. Perhaps it’s unfair to use a 15-year-old game in comparison with so many modern titles, but Doom accomplished so much for its time, and some of its fantastic gunfights have only rarely been matched in current games. 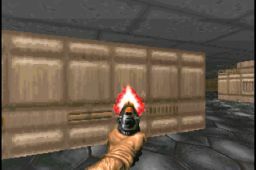 The pistol from Doom is a bit timid these days, with its red-tinged hand-drawn muzzle flash and staccato “pow” sound effect… The impact effect on the walls is nice and visible, though the smoke rises too quickly taking the attention away from the point of impact. The slight “light” from the muzzle flash does well considering how old the tech is. The effect from striking the opponent is a nice red “flower” of blood, and the sprite enemies play jerky “hit” animation frames enough to get the point across so that you definitely feel like you’re hurting your foe. 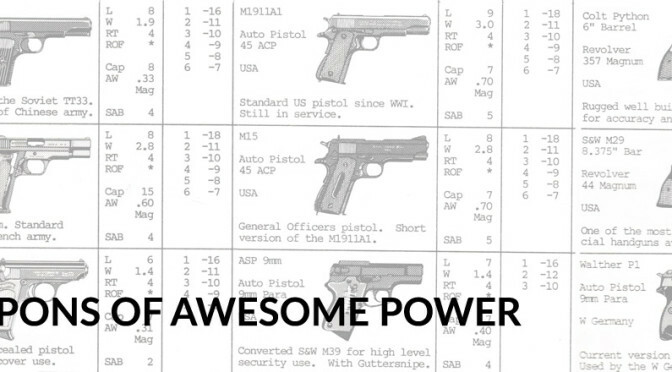 Finally, the pistol was a solid weapon for base enemies, taking them out in 3 or so shots, unlike pistols from many of the other games. This game was not really known for its fast-action gameplay, but it provides an interesting comparison with other FPS weaponry. The muzzle flash is big, but it clearly was mostly a single flat polygon that doesn’t look white hot like its competitors do. The sound effect is certainly not timid, with a big “crashy” gunshot with a long, loud echo. The most disappointing part of this weapon is how little result you see on the environment, spouting only a tiny speck of wall from an impact. Enemies do not fare much better, with almost no effect appearing on a target when hit, and no hit reaction animation. Finally, since the game is extensively skill-based, the player’s accuracy with guns at the beginning of the game is ridiculously low, leading to many impotent-feeling shots. When I started this exercise, I almost forgot to include Bioshock, but I’m glad it made the list. 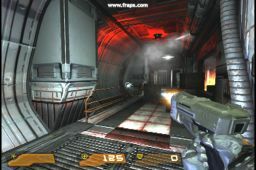 Its pistol has a bright, large muzzle flash and cascading sparks, including from the hammer, as well as some nice lighting on the dark surroundings. 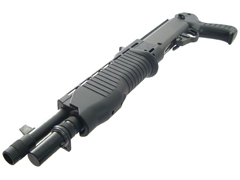 The gunshot sound is a bit deeper than most of the others, but it has a fairly good echo after the initial crack. The surface impacts are the most impressive of this set, with lots of dust and sparks blooming from the point of impact, along with a chunk or two of the impacted surface. The impact on enemies is extremely rewarding, paying successful hits with glistening gouts of blood that nearly rival the excess and stylishness of Gears of War. Finally, the weapon’s fairly effective in combat and can be used as a staple weapon, as long as you can deal with the 6-shot reload cycle. The only unfortunately thing is animation of the weapon itself… Its placement onscreen evokes someone holding the weapon as far to the right of their head as possible, giving the overall firing and reloading actions a sort of weird “gangly” look. Compare this to most games that anchor the weapons about 1/3 from the bottom right corner.